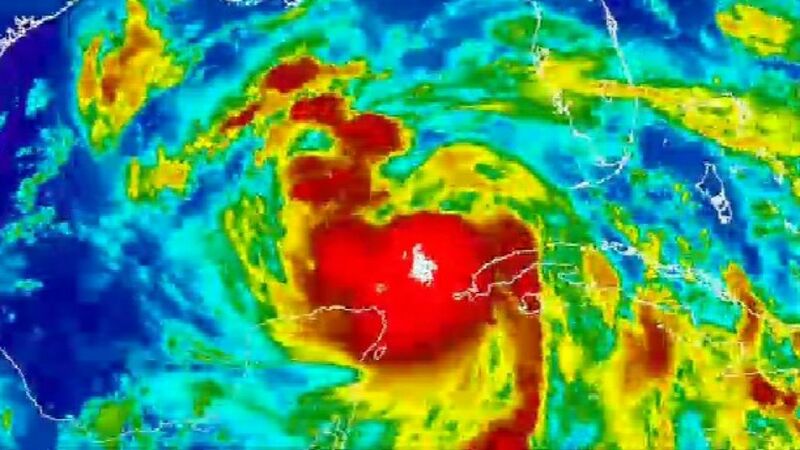 Hurricane Nate is threatening the US central Gulf Coast after killing at least 25 people in Central America. Residents in areas outside New Orleans' levee system have been evacuated as the category one hurricane churns northwards through the gulf. The National Hurricane Center in Miami has issued hurricane and storm surge warnings for southeast Louisiana and the Mississippi and Alabama coasts. States of emergency have also been declared in all three states, as well as 29 Florida counties, with Nate expected to strengthen as it nears the coast. It is expected to make landfall on Saturday night and dump up to 10 inches of rain in some areas. New Orleans mayor Mitch Landrieu said: "Nate is at our doorstep or will be soon. "We have been through this many, many times. There is no need to panic." The storm passed by Mexico's Yucatan peninsula - home to beach resorts incuding Cancun and Playa del Carmen - as it headed north. It saw maximum sustained winds of 80mph and was around 400 miles south-southeast of the Mississippi river on Saturday. Around three quarters of US Gulf of Mexico oil production was turned offline ahead of the hurricane's arrival. At least 12 people were killed by the storm in Nicaragua, nine in Costa Rica, two in Honduras and two in El Salvador. Thousands have also been forced to evacuate their homes over fears of landslides and flooding.